We have a blind dog that we ring a bell for when we need her to come and a deaf dog we flicker the lights on and off for. It is fun to be creative when designing for pets in your life. Not every kitchen will have a pet, but if you do, let’s not forget about them when designing your kitchen. 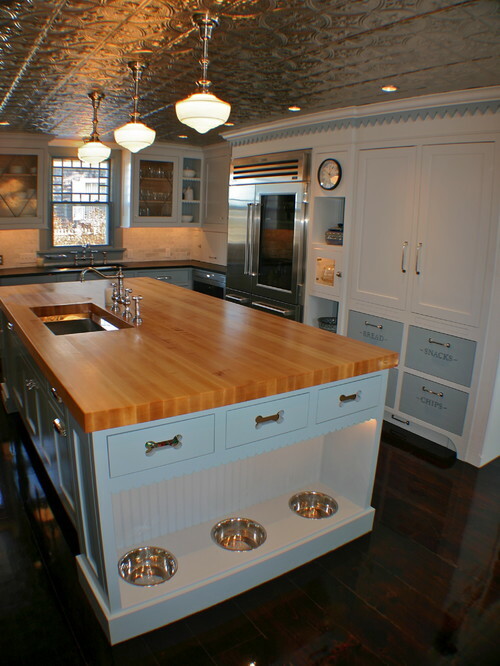 If your pets are part of the family like ours are, then you will want to think about a few things to accommodate them when designing your new kitchen. 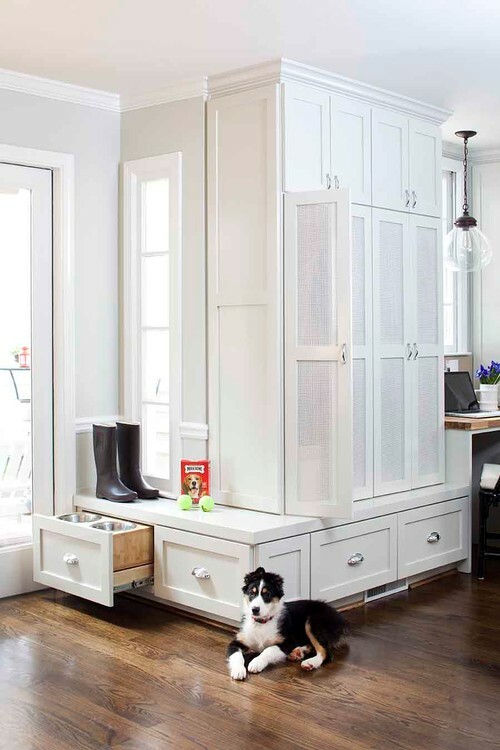 If you have the room, you may want to design a place of their own like this dog room with laundry. There is nothing worse than stepping on or in the cat or dog food, so a well designed space will consider a feeding area where we are not tripping over the food bowls. 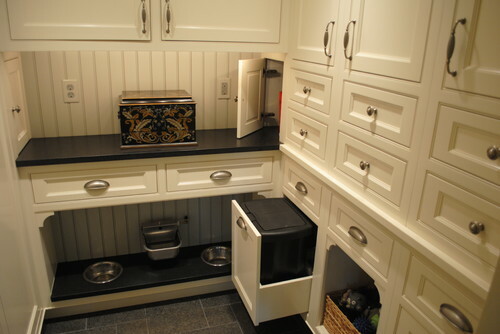 You can also hide the feeding area in the cabinetry. Where will the pet food be stored? We can build in a pet food storage system, or you can purchase a great looking container or canister. SimpleHuman.com happens to have a fantastic stainless steel bin designed specifically for pet food with a built-in scoop. Their smaller stainless kitchen canisters work well for pet treats too. Storage bins to keep the food fresh and accessible. My cats love to shred the bags and this prevents a mess later. I love cabinet rollouts for storing pet food cans in the pantry. The rollouts are easy to slide and maximize the storage space. Whether you have an animal that is big or small, let’s not forget where are our furry friends are going to hang out. If we think about our pets and keep them in mind during the kitchen design process, then they won’t remind us we forgot to think of them.